Because we all need our beauty sleep. There’s nothing more rewarding than a good night’s sleep, and we can attest that a proper mattress does the trick. The average lifespan is around seven years, so if back pain and restless nights are part of the current routine, these are key signs it’s time for a new mattress. While Mattress Advisor notes it’s a hefty investment, break it down like this: “If you buy a $1,000 mattress, only sleep on it for 300 days out of the year, and own it for seven years, you’re essentially paying $0.48 a day to get a great night’s sleep,” says Alesandra Wooley, the company’s executive editor. To put it into perspective, your daily morning lattes cost ten times this price—so think of it this way to avoid initial sticker shock. 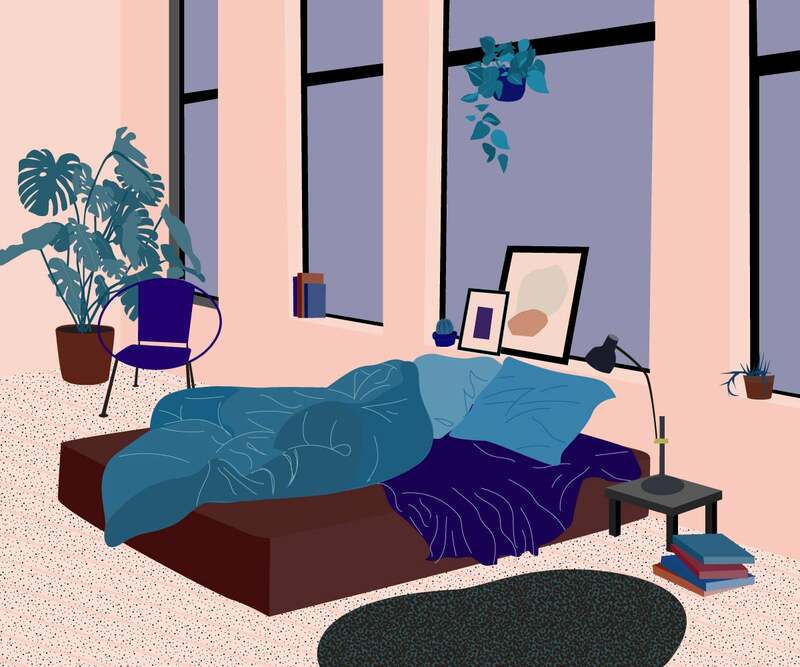 We turned to the mattress experts to find out how to spot signs of wear and tear, what to look for when shopping for a new mattress, self-care tips, and much more. Wake up feeling rested, work more efficiently, and conquer the day thanks to something as simple as a night of uninterrupted sleep. “There are several signs you know it’s time for a new mattress, including morning aches and pains, tossing and turning while you sleep, and of course the age of the mattress,” says Barry Cik, founder of Naturepedic Organic Mattresses. “Over time, the materials in a mattress can start deteriorating or can start to lose shape, particularly in areas that get the most use,” says Wooley. Pay attention to this warning sign, she notes, and “act quickly,” as it will do a number on the body if not mindful. Insomnia happens to the best of us, but it could very well be a sign of needing a new bed. “Not being able to find a comfortable position on your mattress is another sign that it might be time for a new one,” says Wooley. This is the result of the mattress losing the ability to support the body, and it means you’ll really start to toss and turn and wake up feeling horrendous each morning. If waking up sans a good night’s sleep is a regular event for you, it’s a telltale sign you’re in need of a new mattress. “If you are unsure if you are experiencing discomfort or poor sleep because you are due for a new mattress, try sleeping on a different mattress for a few days if possible,” says Cik. Monitor patterns and consider a mattress upgrade if sleep patterns are all over the place. Comfort aside, sweat and germs are cringe-worthy factors to take note of when it comes to the expiration date. Wooley adds that the average person sweats half a pint of perspiration each night, so think about that adding up over time. Gross. “Sure you can clean your mattress and use a mattress protector, but over time, there are inevitably dust mites, bacteria, bodily fluids, and other microorganisms that will make their way into the layers of your mattress,” she says. If the mattress has lost all firmness, there’s a solid chance you’ll wake up with numb limbs. “Your body is essentially getting stuck in certain parts of the mattress, which is not a great position for physically recharging and rejuvenating muscles—a critical part of sleep,” Wooley notes. This should be a solid sign to prompt mattress shopping. Snoring is one matter, but if a significant other is waking you at every roll or shift in bed, it’s going to drive you mad. And it’s probably time to toss the mattress to the curb. Everyone loves a good night’s sleep in a quiet, comfortable hotel room sans spouse (or kids, or dogs) from time to time, but you should ultimately miss your amazing bed when away from home. If you find yourself wanting to check into a hotel just for a solid night of z’s, it might be time to think about a mattress upgrade at home. If a new mattress isn’t financially in your cards, there are a few key products to temporarily help extend the life of your current mattress for a fraction of the price. Seek out products like Mattress Helper and No Sags to help support saggy mattresses and keep it more firm (which will help with back pain, too). Note that this is only short-term and will give you time to shop for a long-term solution that really caters to your body. Many online companies offer a ‘try before you buy’ deal where you can spend up to 120 days testing out a new bed before owning it. This will truly show the mattress and all its glory (or not), so the money is well spent at the end of the day. Check out brands such as Tuft & Needle, Helix, Tulo, and Casper. Finding the right mattress is key for a sound night’s sleep, and it’s all about personal preference. “We truly believe that everyone deserves a wonderful night sleep, so we design mattresses for all sleep types—from stomach, side or hot sleepers,” he says. When properly caring for a mattress, the obvious solution—and what most will relay—is to flip it over to keep it bouncy and comfortable. Darren Wilson, vice president of marketing at Zinus, notes that flipping the mattress “will prevent uneven wear and extend mattress life.” Instead, rotate it so you’re sleeping on different sides. While it might be tempting to rip the cover that comes with the mattress off in a heartbeat, don’t do it. “All of our mattresses come with a cover that isn’t made for removing or washing and removing it could inhibit the fire safety barrier, so we recommend to always leave the cover on,” says Wilson. Not to mention, the cover will help keep the mattress in pristine shape.